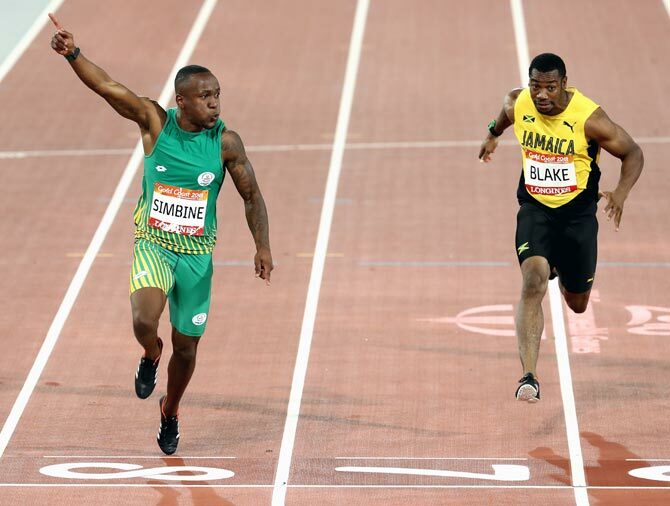 Akani Simbine upset Jamaica's Yohan Blake to win the 100 metres gold medal for South Africa at the Commonwealth Games in Gold Coast on Monday. With a packed crowd at Carrara Stadium roaring, Simbine blazed down the straight and crossed ahead of team mate Henricho Bruintjies in 10.03 seconds. Blake finished with bronze in a time of 10.19 seconds, after qualifying fastest with a time of 10.06 in the semi-finals. The path to gold was made smoother for Simbine, with England runner Adam Gemili, a 4x100m relay gold medallist at the London world championships, pulling out before the final with a thigh injury.